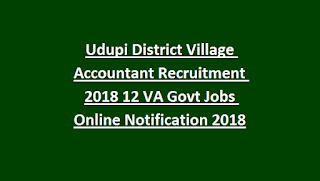 class or Diploma and having computer knowledge they can apply online for this Udupi District VA jobs through official website of udupi-va.kar.nic.in. Candidates who is having merit they are only preferred for the recruitment of VA jobs in Revenue department. Online application for this Udupi District VA jobs will be available from 15-12-2018 to 31-12-2018. Detailed information for this Udupi District VA jobs recruitment category wise vacancies, online application form and other details are given below. 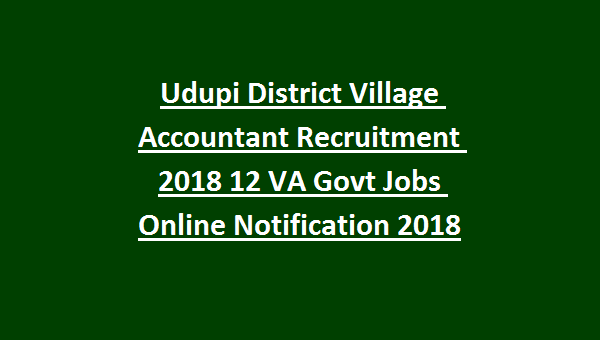 There are total 12 VA posts in this Udupi Revenue Department recruitment 2018. Upper age limit is 40 years for general candidates, 35 years for General candidates and for all other posts 38 years. 12th passed or Diploma qualified candidates are eligible to apply. Candidates selection will be through merit in qualifying exam marks percentage and documents verification. Candidates who are looking for this VA jobs in Udupi District they can aply online before the closing date of 31-12-2018. Official website to online form submission is udupi-va.kar.nic.in.